See also Anaesthesia News 2017; 354: 26. Published in Proceedings of the History of Anaesthesia Society 2017; 50: 143-150. See also Anaesthesia 2017; 72: 535-6. 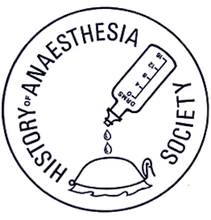 Published in Proceedings of the History of Anaesthesia Society 2015; 48: 140-142. Published in Proceedings of the History of Anaesthesia Society 2012; 44: 179-181. Published in Proceedings of the History of Anaesthesia Society 2012; 44: 176-178. Published in Proceedings of the History of Anaesthesia Society 2008; 39: 9-14. Published in Proceedings of the History of Anaesthesia Society 2006; 36: 109-110. Published in Proceedings of the History of Anaesthesia Society 2003; 33: 43-44. Published in Proceedings of the History of Anaesthesia Society 2003; 32: 68-71. Published in Proceedings of the History of Anaesthesia Society 2002; 31: 67-69. Published in Proceedings of the History of Anaesthesia Society 2002; 30: 107-109. Published in Proceedings of the History of Anaesthesia Society 2002; 30: 106-107. Published in Proceedings of the History of Anaesthesia Society 2002; 30: 103-105. Published in Proceedings of the History of Anaesthesia Society 2001; 29: 92-95. Published in Proceedings of the History of Anaesthesia Society 2000; 28: 70. Published in Proceedings of the History of Anaesthesia Society 2000; 27: 65-68. Published in Proceedings of the History of Anaesthesia Society 1999; 26: 62-63. Published in Proceedings of the History of Anaesthesia Society 1999; 26: 62. Published in Proceedings of the History of Anaesthesia Society 1998; 24: 68-69. Published in Proceedings of the History of Anaesthesia Society 1995; 18: 68. Published in Proceedings of the History of Anaesthesia Society 1995; 17: 109. Published in Proceedings of the History of Anaesthesia Society 1995; 17: 103-108. Published in Proceedings of the History of Anaesthesia Society 1994; 16: 90-91. Published in Proceedings of the History of Anaesthesia Society 1992; 11: 63-64. Published in Proceedings of the History of Anaesthesia Society 1992; 11: 62-63. Published in Proceedings of the History of Anaesthesia Society 1991; 9b: 96-97. Published in Proceedings of the History of Anaesthesia Society 1990; 7: 53. Published in Proceedings of the History of Anaesthesia Society 1989; 6b: 101-103. Published in Proceedings of the History of Anaesthesia Society 1989; 5: 76.